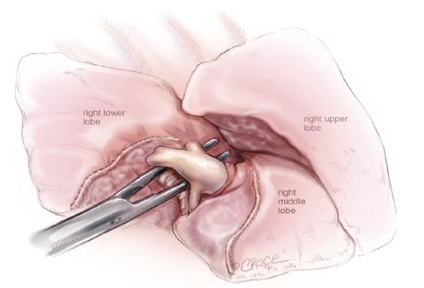 In the past, lung surgery required a major open procedure, this approach involves making a large incision and spreading the ribs apart with retractors. With new technological developments, it is now possible to perform lung surgery via a much less invasive approach, known as “Minimally Invasive Pulmonary Resection”. 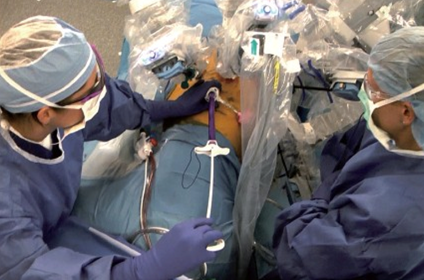 This approach has without doubt been the most important advance in thoracic surgery. No other single innovation has so totally revolutionized the way thoracic surgeons perform their craft, or so greatly improved the surgical experience for patients undergoing lung operations worldwide. Now is a crucial transition point—we are witnessing the VATS lobectomy technique transforming from an experimental procedure to the standard of care for patients with early-stage lung cancer. 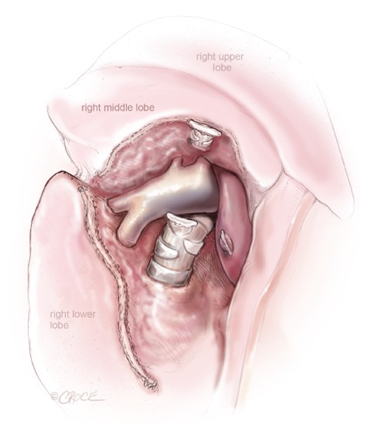 There are two forms of minimally invasive or “key-hole” lung surgery: video-assisted thoracoscopic surgery (VATS) and robotic-assisted surgery. Both of these techniques involve insertion of long instruments through small incisions in the chest wall. One of the instruments is a small camera, or thoracoscope, which projects to a monitor. This allows the surgeon to visualize inside the chest cavity in a magnified fashion during the operation. Minimally invasive lung surgery has a number of proven benefits over open thoracotomy, including: smaller incisions, better cosmesis, significantly reduced post-operative pain, shorter hospital stay, usually 3-4 days and more rapid return to full activity. Professor Tristan Yan has a solid surgical oncology background through the years of general surgical experience with Professor David Morris and Dr. Paul Sugarbaker, both are world authorities in cancer surgery. He worked closely with Professor Brian McCaughan at the Royal Prince Alfred Hospital in Sydney, who provided him with substantial clinical experience in the surgical management of lung cancer. Professor Yan then underwent Minimally Invasive Thoracic Surgery fellowship with the pioneer of this technique, Mr. William Walker, in Edinburgh, where he mastered the technical expertise of “keyhole” operation to perform complex lung resections, such as lobectomy and segmentectomy. Subsequently, Professor Yan was mentored by Dr Bernard Park, a world-expert in Robotic Thoracic Surgery at the Hackensack University Medical Center in the United States. Professor Yan organized the VATS Lobectomy Consensus Statement, which marked the 20th anniversary of this procedure. For the first time in history, 50 world-leading minimally invasive thoracic surgeons from 16 countries reached consensus agreements on several important issues on VATS lobectomy, including its definition, patient eligibility, surgical standard of care and future training. Professor Yan is co-president of Asia-Pacific Minimally Invasive Thoracic Surgery and one of the most experienced minimally invasive thoracic surgeons in the country. The VATS Lobectomy program founded by Professor Yan is entirely dedicated to improving patient outcomes and quality of life. To see if you are qualified for minimally invasive lung procedures, please ask your general practitioner or treating specialist for a referral and book for an appointment with Professor Tristan Yan. A teleconsultation could also be arranged for you, if you meet the criteria of a remote or rural patient. These consultations can be conducted over the Internet through Skye. (Download latest version of Skype here).